UDM Downloads > Excel Password Unlocker Software! Most excellent Excel Password Unlocker Software is highly developed Microsoft Excel Password Recovery Software to unlock and recover excel password from Microsoft Excel. 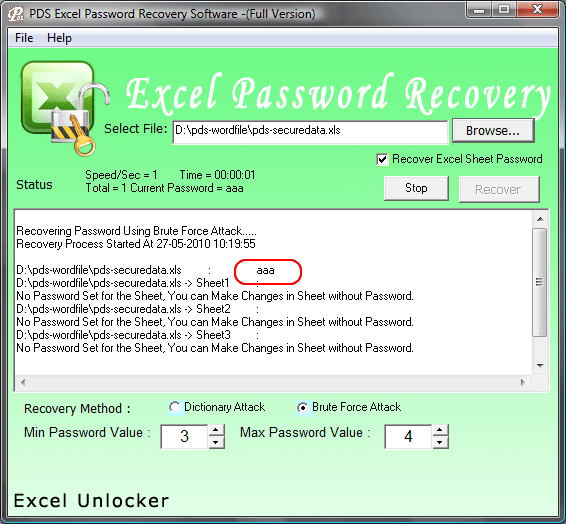 PDS Excel Password Unlocker software easily recovers lost or forgotten Excel database passwords from Microsoft Excel Spreadsheet. Demo version of PDS Excel Password Recovery software and tool having most wonderful and powerful facility for users to recover 3 character password of the protected MS Excel Spreadsheet. PDS Excel Password unlocker is best XLS Crack helps you to find Excel "open" and "Sheet" password from locked MS Excel protected files (.xls). Best Excel Password Unlocker Tool is professional excel password remover software for system and security administrator and everyone who have troubles with MS Office Excel security. With PDS XLS Password Remover, You can easily get- * MS Excel File Open password and * MS Excel File Modification password MS Excel Password Unlocker program features: * Unlock password from password protected MS Excel file. * Unlock Multilingual excel password * Recover Excel Sheet password to modify the file content. * No Spyware and Trojans * Easy and simple to install * Support Install and Uninstall * 24X7 Online technical support Excel Password Recovery Software having all above features to unlock MS Excel sheet password. Excel Password Unlocker software supports all versions of MS Excel 95, 97, 2002, 2002 (XP), 2003. Easily and smoothly install on every version of Windows OS including Windows7 OS and unlock xls password.